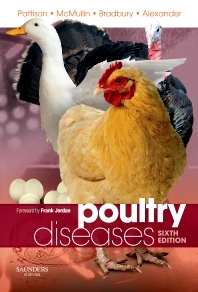 Now in its sixth edition, Poultry Diseases is once again fully revised with the addition of vital new material. It remains the standard reference work on health and disease for those involved in the poultry industry, government and veterinary education. Following a familiar structure, readers of the sixth edition gain concise but major reviews on current knowledge of general and disease-specific topics discussed over 45 (5 new) chapters in seven sections. With a large international team of contributors led by an authoritative editor team and a Foreword by Professor Frank Jordan, Poultry Diseases is an invaluable resource for the practicing veterinarian, poultry inspector, agricultural manager or veterinary student. turkeys, game birds and guinea-fowl).